I sent a letter to the biggest feed manufacturers in the UK, and within 2 weeks two of their directors traveled to the Isle of Wight to see me. I gave them a prototype to take away and test, and within a further 2 weeks they said they would like to link 16 of their products to my can, and put me in touch with a watering can manufacturer. However, pretty quickly they realised that the Push Button Can would not only save water, but more importantly save feed and weed killer, which was not in their interest, and the offer to link their products was withdrawn. Didn’t stop me though! 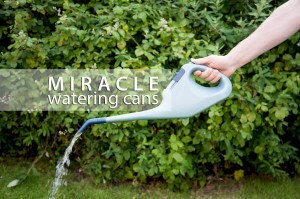 I bought 50 watering cans from a local supplier, adapted them, sold them, bought 100, did the same, sold them, and so on. Now I have the cans manufactured myself and sell them as the Miracle Watering cans, the NuCan 7 litre outdoor watering can and the Pinpoint 1.3 litre indoor watering can, and have now sold many thousand to some very satisfied customers, including disabled and blind gardeners, I also supply schools and hospitals where the control and non spill is very much appreciated.